Dont leave your wall bare, fill it with some woodsy style! 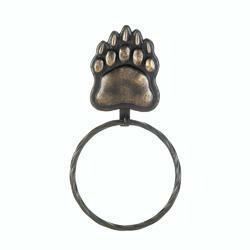 This bear paw towel ring mounts to your wall to create a convenient place to hang a hand towel. Weight 0.6 pounds. 6.62" x 0.75" x 12.2". Polyresin, Iron. UPC Number: 849179028954.